We've had plenty of adventures near our Chatsworth home base that don't deserve an entire blog post. I've decided to record them together because what they have in common is a way of occupying our free time. Mostly on weekends, but not entirely. We connected with friends, Robin and Chris O'Rourke, for a visit to the Getty Center. It houses an extensive art collection in a complex built to show it off. It is an incredibly beautiful spot and amazingly, it is free! We only had to pay for parking. Definitely expect to return when we have visitors in town. On St. Patrick's Day, the NJ Devils came to LA to play against the Kings. We've been Devils fans a long time and were so glad they finally had a decent season and later made it into the playoffs. It was fun to cheer even if we weren't rooting for the home team. Number 13 was in his rookie NHL season and also Swiss. It was a lot of fun to see him in action - he's very fast. The best part of the afternoon: an exciting 3-0 win! We didn't have as many shots on goal, but we made them count. One evening we headed to the Herb Alpert School of Music at UCLA for an orchestra concert. Westfield's own, Francis Wong, was the concertmaster. His sister was one of Alicia's best friends in Westfield - we knew he was in CA. He is not a music major, but a very talented violinist. Tom's birthday and Easter coincided on April 1. Since he was celebrating a "big" birthday, Alicia suggested she fly out to surprise him. I was all in favor of the idea and we were able to pull off the surprise. The door bell rang one evening and Tom asked, "are you expecting anyone?" "No." He proceeded to go answer the door. He opened the door at the same time as saying "can I help you?" Alicia was as surprised by his question as he was at seeing her. Denali and Alicia took turns modeling Easter bunny ears. We hosted Easter dinner including some of Tom's family. We enjoy hiking, but after years in Switzerland we've been spoiled by the well marked, groomed trails. It's been challenging finding good hiking here. Recently, we explored Eaton Canyon, near Pasadena. My Uber driver said it was his favorite hiking spot. We rated it "ok" - nothing special. It was definitely overcrowded for our taste. Not willing to give up on CA hiking, we tried Topanga State Park. It's closer to home and was a more enjoyable hike. We rated it "best in CA, so far". Which trail? Not exactly a lot of help. I love cats, big and small, but do NOT want to encounter one on the trail! One of the best things about this hike was the timing of our trip - the wildflowers were abundant. Lots of varieties we'd never seen before. There were many fewer benches provided than in Switzerland and it's not red, but the view was nice. I also like the inscription and that's my favorite hiker! During our time in Switzerland, I went to plenty of festivals surrounding food (onions, carrots, turnips and the agricultural fair). When I heard the strawberry festival advertised, it seemed like a must see. We've been and have declared it a "one and done." It was a cross between a carnival and an arts/crafts fair with a strawberry theme. Disappointing, but the strawberries were tasty! tent was hopping well before noon! This woman was definitely over-enthused about strawberries. I don't know whether she was paid to dress like this, but I didn't see many others in costume. These blocks were my absolute favorite from the craft booths. How clever that the blocks are designed to make castles. I went to lots of markets in Europe and never saw anything like this. They're missing an opportunity. As a farewell gift, Tom's department in Zurich gave him a gift certificate to the LA Opera. Since it was such a generous gift, we were able to go to two events with only a small supplement. 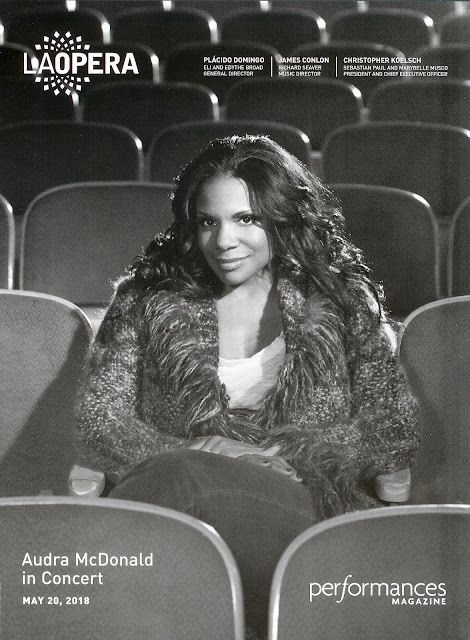 We'd already been to Candide in February and in May, Audra McDonald was in town. We'd seen and heard her in Porgy and Bess in NYC several years ago. This time she sang a solo recital with either an orchestra, small ensemble or piano accompaniment. She also introduced every song with a little story. The concert was fabulous! My only criticism is that there was no listing of what she sang in the program. I realize that as she is touring, the concerts may vary some. I think they could have listed all the possibilities and told the audience that she'd perform selections from... Instead, I can't remember many of the titles she sang and can't look them up now. I still highly recommend going to hear her perform. It'd be money well spent. We try to take advantage of holiday weekends to venture a tad farther afield. They allow time to travel (but oh my, the traffic!) and stay overnight. We chose to explore Idyllwild, CA over Memorial Day weekend at the recommendation of friends. We rented the "Secret Garden Cottage" for the weekend. Why it is called secret garden is a mystery. The knotty pine interior was reminiscent of the Westport cottage. There were lots of antique furnishings, but a modern kitchen, wifi and netflix. I tried on the crown - it's heavy! After learning the rules of the local trails and where you need a permit, we decided to leave the car at the cottage and walk up to Humber Park. It was a bit more taxing than we anticipated, but manageable. Finally, we found good hiking! The topography and views were reminiscent of Yosemite or New England. This "totem pole" is just one of the decorations we spotted in front of a private home. Besides good hiking, Idyllwild is a cute town. Evidently they had a fund raiser a while back where people painted deer - they are now on display around town. rock climbers climbing on the deer - does that hurt? We wandered the town and did some browsing, but also got in a second hike. There were plenty of wild lilacs on this trail. Before getting on the "freeway" back to LA, we stopped at Lake Fulmor for one last stroll. It's really more of a pond, but a very pretty spot. We had a great weekend getaway in Idyllwild. We'd definitely like to come back, but who knows? There are so many places to explore.